Are you getting the best rate of return on investment? Kiplinger’s Personal Finance Magazine annually discusses ways to boost your investment yield in their latest issue. I have to say that I am always pretty disappointed in their recommendations. I love the magazine, but I didn’t really care for a list of mutual funds and Exchange Traded Funds (ETFs). But, I wanted concrete ideas on how to earn a 10% annual rate of return on my investments. But, are these levels going to last? The stock market has returned an after of 8% annually over the past century. But, where can an investor find 10% when the market retraces or moves sideways? Here are 10 ways to earn a 10% ROI on your investments or maybe even more. Additionally, there are a few extra bonus ideas to help you earn a great rate of return on investments. Peer-To-Peer Lending through companies like Lending Club are my favorite way to earn a rate of return on investment over 10% annually. Lending Club’s most conservatively A rated loan earns over 6% for the investor. It does not take long or much more risk to earn over 10% returns. And, Lending Club’s most risky investments earn a rate of return on investment of over 20% annually. I’m a huge fan of Lending Club and have recommended investors adding Lending Club loans to their investment portfolio for years here on Money Q&A. Real estate is a great way to earn over 10% rate of return on investments. I’m a big fan of becoming a landlord which I’ve talked about several times here on Money Q&A. While you need to run your numbers and do your research, you can earn a 10% rate of return on investments with your rents. Roofstock is the #1 marketplace for buying and selling single-family rental homes. Roofstock has listings in over 40 markets across the US. 1 in 10 homes in the U.S. are single-family rentals (SFR), which equates to over 15 million households. Single-family rentals are a stable asset class with considerably less volatility than stocks. Single-family rentals prices have remained almost perfectly uncorrelated with stock prices since 1971, with a correlation coefficient of only 0.07. Their online marketplace empowers everyday investors to own cash-flowing income properties and build wealth through real estate. Roofstock makes it easy to invest remotely. Over 60% of their customers are buying rental property located more than 1,000 miles away. With their market analysis, Roofstock provides research and data analysis to help you determine which locations meet your investing objectives. Roofstock’s marketplace offers rental homes for sale in 40 markets and 21 states nationwide, and they are continuing to expand. Roofstock surpassed $1 billion of collective transaction volume within two years of its marketplace launch, making it one of the fastest-growing FinTech startups of all time. And, their industry-leading Roofstock Guarantee empowers investors to buy remotely with total confidence. Their certified properties are inspected and come with a 30-Day, Money-Back Guarantee, so you can invest remotely with confidence. Building a real estate portfolio with PeerStreet is simple. You can create your own portfolio of real estate loan investments, or you can allow PeerStreet to do the research and investing for you with automated investing capability. You just select a few custom parameters, and PeerStreet will place you into real estate loans automatically. PeerStreet Investments - Crowd Funded Real Estate Investments Crowdfunded Short-Term Real Estate Investments with Historical APRs between 6%-10%? returns. PeerStreet’s team of finance and real estate experts underwrites each loan using advanced algorithms, big data analytics, and manual processes to ensure PeerStreet surfaces high-quality investments. They vet originators and allow only experienced private lenders with great industry track records onto the platform. Those originators run their own due diligence process to hand-select the borrowers to whom they’re willing to lend. This creates higher quality loans in greater quantity. So, you can invest with confidence. Real Estate Investment Trusts (REIT) are another great option if you do not want to own real estate directly. REITs are required by law to distribute a majority of their earnings to their shareholders in the form of dividends. These payouts and real estate’s impending comeback make REITs an attractive alternative to help investors reach the 10% threshold. Investors can browse many different types of real estate investments. And, qualified investors can start with as little as $5,000. There’s a wide variety of property types, returns, and locations to invest in for investors. Paying off a debt with a high interest rate is the same as having earned that exact same rate of return on investments would have given you. It is all about opportunity costs. In fact, that’s also what I recommend people do with a pay raise as well. It is all about the best opportunity for you to put your money to work for you. For example, if you have a credit card with a balance that is charging you a 16% interest rate, paying off that debt would be the same as having invested and earning that 16% on the investment. Paying off high-interest debt is a great way to earn a stellar rate of return. Make investing in stocks for the long-term automatic. It’s easy to up automatic investments either with your bank, a discount broker, or even a smartphone app like Robinhood. Put money away every month, when time are good and times are bad. Avoiding investing mistakes will make you more money in the long run than trying to pick the hottest sector/stock/fund/investment over the years. With the help of a Financial Planner, you can pick a well-diversified investment portfolio appropriate to your financial situation and the amount of risk that you are willing to accept. Granted, you may need to take on more risk if you want that 10% rate of return. Most of us are a victim of recency bias. An entire generation of investors has only known the stock market of 2003 to 2013. Our most recent past is not a precursor to what our long-term investing future will be. A 10% annual rate of return on investments over the long term is very much achievable. If you’re looking for places to keep traditional investment accounts, you might want to check out investing with Betterment or Stash Invest. The newest robo-advisor on the market called M1 Finance gives the more established, sophisticated investors great investing options. M1 Finance simplifies the investment process for beginning and experienced investors alike. Unlike other robo-advisors, M1 Finance does not charge a fee, and it gives you the option of taking more control over your investments if you want them (and less if you don’t). Granted, short-term stock trading is not for everyone and should not be done with a large portion of your entire investment portfolio. Trying to time the stock market is a rough way to earn a 10% rate of return on investments, but it could be well worth your time and efforts with a small portion of your investment portfolio. I’ve been having a blast trading stocks on a short-term basis. And, even better, I’m up 15% over the course of the past 12 weeks. That’s a lot better than 10% annualized of course. Many swing trading services teach investors how to, not day trade, but invest in small cap stocks which are held only a few days or weeks. You can follow along as the service trades their own portfolios, mirror their trades, and learn the ropes of short-term technical analysis trading. I was skeptical at first, but I have actually really enjoyed getting back into stock trading. It also doesn’t hurt that I’m up, of course! I am a huge fan of starting your own business. I wish everyone would have the entrepreneurial spirit. It was one of the best ways to earn a 10% rate of return on investment. Whether it is opening a neighborhood restaurant or as simple as starting a blog, a business venture is a great way to boost your investments’ returns. Master Limited Partnerships are a type of business organization. There are two different classes of partners for master limited partnerships. They are limited partners and general partners. You need to know about these classes when looking to invest. The limited partners purchase units in the business to provide capital for the business and receive income distributions. The general partner is responsible for managing the business and receives income on a compensation basis. Master Limited Partnerships are commonly found within the energy industry. And, they are very attractive to investors because they offer a stable income based on long-term service contracts. These contracts can range from the provision to the management of oil or gas pipelines. Master Limited Partnerships are partnerships that trade like a stock. They are risky and not for every investor, but they can often offer a larger rate of return than other investments. Many MLPs invest in the energy sector, minerals, and other raw material type ventures. They often have a high yield because they do not pay income taxes themselves and pass on that responsibility to their shareholders. One of the primary ways that Master Limited Partnerships differ from a corporation is the fact that it is considered to be an aggregate of the partners and not a separate legal entity. One of the distinguishing features of these partnerships is the tax benefits of the partnership. The profits from the company can only be taxed when the unitholders receive distributions. The liquidity of the company is the same as any other type of publically traded company. Master Limited Partnerships are often used in slow-growing industries such as the energy industry. As these industries are slow growing they offer a lower risk to investors. Of course, you need to consider the fact that any industry can have volatility so you should look into this before investing. The steady investment will bring a steady cash flow through distributions. The cash distributions generally grow faster than inflation and when bought by limited partners can be 80% to 90% tax-deferred. The business will also avoid double taxation as there is a pass-through where the business passes the income to the unitholder which means that there is more capital for future projects. Another benefit for limited partners is that cash distribution generally exceeds capital gains tax when all units are sold. However, the sale of the units will not be taxed as ordinary income. Good art, great collectibles, or even quality antiques as a whole are safe investments that tend to grow in value at as good as or better rate than almost any other investment. Plus they–unlike stocks or bonds–have the added bonus of your being able to enjoy them in your home on a daily basis. Collecting Legos returned more than investing in large stocks, bonds, and gold over the three decades ending in 2015, per a recent study from economists. Collections for Jedi starfighters and Hogwarts castles, for example, have yielded 11% annually. Legos aren’t exactly exposed to market-roiling volatility. Plus, there’s an enormous secondary market for Legos, in which “tens of thousands of transactions per day” take place. For example, a Lego kit for Star Wars Darth Revan retailed for $3.99 in 2014 and sold for $28.46 on eBay a year later. That’s a 613% premium. Newer sets have higher returns than older sets. The higher value is possibly due to the growing popularity of Legos becoming an investment. And, “The Lego Movie 2: The Second Part” hits theaters in February 2019. I love finding gems like these in amazing newsletters like Morning Brew! A 5-minute read that’s informative, witty and free? That’s Morning Brew — the daily email that delivers the latest news from Wall Street to Silicon Valley. Sign up for free. Robert Pagliariri wrote one of my favorite books, “The Other 8 Hours“, where he talked about becoming a creator. It is not enough to simply work a 9 to 5 job and hope to become rich. It unfortunately just does not work that way. Those who are more successful than most are creators. They create businesses. Products create products. They make things people want to buy. That’s how you can earn a 10% rate of return on investments. Junk bonds get a bad rap simply because of their name. But, don’t be fool by the lingo. There are basically two categories of bonds: investment grade and junk bonds. Junk bonds offer higher interest rates and lower rates of volatility that individual stocks might experience regular market fluctuations. Perhaps the entity issuing junk bonds is trying to grow its company and offer more sustainable, long-term growth for investors but it’s presently struggling with consistent revenue in the process. While these bonds are considered “noninvestment grade” bonds, there is still a variety of types to choose from, such as Standard & Poors bond ratings of BB, B, CCC, CC, C, and D.
Junk bonds are simply high yield, higher risk bonds from companies who have seen their credit ratings suffer from the rating agencies like Moody’s and Standard and Poors. Junk bonds typically have a rating of BB or Ba or less depending on whose scale you use. The Barclays US Investment Grade Credit Index, which tracks high-grade bonds, returned 1.63% through April of this year. The safest grade junk bond is earning 5% interest annually with less safe options earning a rate of return more than that. While 10% may be the riskiest of all junk bonds, it is still possible with some to earn that much. Precious metals can be a great alternative investment for your portfolio to help you earn a great rate of return on investments. Like most investments on this list, you should consider investing in gold, silver, and other precious metals with a small percentage of your total investment portfolio. I personally love to invest in silver. It is more volatile than gold, and the potential for upside is greater to help you earn that 10% rate of return on investments. You can even invest in precious metals in a gold or silver IRA through an investment company. Year to date (YTD), silver is up over 36% from $13.81 to $18.83 per ounce. Individual investors can buy action from professional and amateur poker players. And, staking poker players can earn investors a great rate of return. Investors put up a part of the buy-in in exchange for a one-time part of the winnings. There are a couple of ways that individual investors can get involved and invest in poker players. If you’re an average or intermediate individual investor with a love for poker and want to invest in poker players, there are a couple of online forums or bulletin boards that can help you find players looking for investors. Check out a couple of the other options that let you easily invest in poker players. Check out my review of investing in a movie recently through WeFunder! If you’re interested in passive income and movies, well, the United States Motion Picture Company has just merged the two together. Equity crowdfunding is like Kickstarter but instead of getting a t-shirt for your money, you own a piece of the movie and earn an income from its profits! To learn more, please click the link below to go to the United States Motion Picture Company’s campaign at the SEC-registered funding portal. What do you think? Did I miss any good ways to earn a 10% rate of return on investment? How do you get the best return on investment? Let me know in the comment section below. I’m glad to see that you included paying off high interest debt. It always amazes me when I see people put money in investments that will never earn anything close to the rate they owe their credit card company or student loan lender. Agreed. I think a lot of that is down to people not knowing exactly what their credit card company is taking for themselves from the payments they receive each month. These are interesting ways. It has indeed captured my attention just like Zimmy said. Will research more about it. Hank, gotta say I’m not a big fan of most of these recommendations. Starting a restaurant for a net 10% return? A blog? Really? Short-term stock trading? Geez. “Safe” junk bonds in this interest rate transition? Nice effort, but I believe you may be shooting from the hip on this one. Hal, I guess that we’ll just have to agree to disagree, and that’s fine. That’s what blogs are for, right? It’s a good conversation, and hopefully you’ll stir up some more. Not shooting from the hip, but investors will surely have to dig deeper for other options to find 10% out there. Well turns out you would have made 400% roi on your bitcoin investment. Hal ate his words. Hank, I think the point is, prudent investing doesn’t begin with a pre-determined rate of return. “Digging deeper” for a 10% return could dig an investor into a life-changing loss. Articles that say “Here’s How to Earn a 10% Return” are just dangerous and misleading. Whether it’s in a blog or in a magazine. Blogs are one thing. But sitting across the table from an investor looking to you for trusted advice with their retirement savings is another. God help them to filter out all the noise. Isn’t a predetermined annual rate of return of 8% built into almost every single financial plan in America? Investing for retirement and other financial goals may start with just that…goals. But if prudent investing doesn’t begin with a predetermined benchmark, then what does it start with? If the market’s historical rate of return is 8% annually, is setting your sites and your goals on 10% that unrealistic? I’m interested in your experience with the swing trading. I don’t have a lot of time to sit at the computer and analyse stocks, but would like to generate a return in the short term to fund a holiday. Can you truthfully share your experience and commitment to the scheme you mentioned. I’m gathering that this is an independent recommendation, and I thank you for that. These are great, unique ideas! And I love the concept that paying off debt is like a 10+% investment. So smart! Thanks, Brittany! It is so true that paying off debt can “earn” you a return. And, it’s the gift that can keep on giving too if you think about what you would have spent. I’ve got to agree with Hal. Most of these are fairly high risk or very time intensive (and since time=money, consider that cutting into your return). Especially want to address P2P lending. Right now everybody is touting P2P lending as ‘safe, high yield’ but we’ve yet to really see what will happen during a market downturn. I suspect they will perform similarly to Junk bonds. Real estate can net a decent return, but definitely carries its own risks. Metals have had some decent runs, but historically have netted closer to 3pct. Don’t even get me started on short term trading. In short (pun intended) highly risky and highly time consuming. Honestly I wouldn’t set a goal based on a rate of return as it leads to bad results. That being said you might have two options for close to risk free return in this ballpark. Your 401k might get an immidiate return of any company match. Also if your company offers an employee stock purchase plan you likely get a 15 percent discount at purchase. Beyond those essentially guaranteed returns if your lucky to be offered them I avoid concentrating too much on a return goal. Hank, despite the naysayers, you are correct on the aggregate. That is, (this from your colleague Todd Tressider), we need to have a blend of each of these ideas in our portfolio. A real estate holding; own a small business; and paper investments are a diversification that will provide the security and returns sought after. 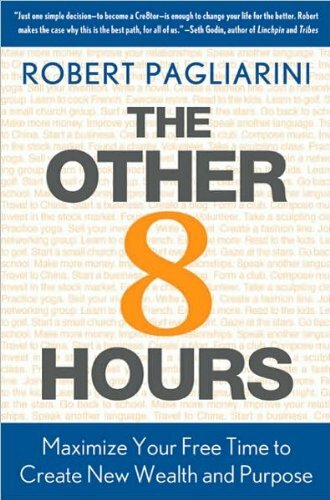 For those who feel that can’t do it, read ‘The Other 8 Hours’ again. The P2P method sounds interesting and I am going to research it more as a way to diversify. I am more of a passive investor and tend to be conservative. My financial plan was never designed around an average of 10% per year. I have a close friend who deals in art and antiques as a side gig. He also sells high end football cards on eBay. I was shocked at the price of how high they sell for. Especially signed and graded QB cards. I’m 19 years old, and this article gave me inspiration and hope to start investing. I believe that it is important to start investing at a young age, which is why I’m doing research on ways to invest. I have hopes of starting my own video filming business, and I was wondering if you could explain how starting a business would give a boost to increase investment return? Hey Hank. Thanks so much for mentioning our movie. We’re super excited to be at the forefront of indie film finance. For the first time in U.S. history, the average person can get what big Hollywood stars get: a chance to make money from a movie. High yield bonds are too overpriced nowadays. The yields are near historic lows, and can only go up. A couple of years ago, I was asked by a friend if I was interested in investing in his friend who is a pro poker player. I somehow know the pro player and have met him a few times at family parties. It was really interesting and have mentioned the idea to my wife. She told me she doesn’t want to do anything that involves gambling. Nice to read about getting a decent return on invesmtments. Great articles. Thank you for sharing! I used to invest and only invested in real estate. To be honest, they paid me more than 10% return most of time. Things changed until a tornado went pass the town where most of my properties located. Now my 10% return became 0% when most of my tenants needed to be evacuated. We always said do not put all the eggs in the same basket. This time I learned my lesson. Expensive lessons though. Have been looking to diversify my investment for a while, awesome article at the perfect timing. Inspired by the tip “Paying Off Your Debt Is Like An Investment”, if I cannot replace the lost rent income at this moment, at lease reducing some debt can give me some time to breath and start build up again. Hi Hank, some good ideas off the beaten track here for people who are just starting to think about putting their money to work outside of a standard deposit account. Not sure you can include a simple ‘get long Bitcoin’ as a reliable way to earn 10% though! Great point, Sam. Bitcoin and cryptocurrencies have definitely changed since added that part in 2017. It’s not exactly the same environment for them now. So happy to see that you included paying off debt! After paying off my student loans, I’ve added so much more money to my budget that I can use to invest. I’ll have to check out some of these recommendations. I don’t really want to become a landlord, but the thought of peer lending interests me.